Since I received a lot of questions about the my IoT home control system, here is a description of it. I've chosen to have connection between the mobile application and both MQTT brokers, instead to have one connection to the cloud broker, because if you are at home and your internet connection is down you can not control any device. Having a connection directly to your home MQTT broker is covering this scenario. 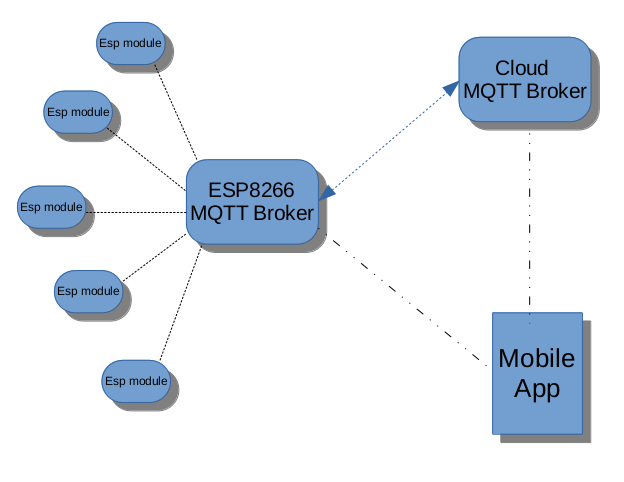 The mobile application first is connecting to the local MQTT broker and if is not succeed ( means you are not at home) it connecting to the cloud MQTT broker. This is done automatically and is transparent to the user. As you can see no port forwarding, nothing to do in your router. Does your MQTT brokers (and clients) use secure encrypted communication?